Gastric duplication cyst (GDC) with a pseudostratified columnar ciliatedepithelium is an uncommon malformation supposed to originate from a respiratorydiverticulum arising from the ventral foregut. Morphologic appearance of GDCs isvariable, depending on the density of their contents. GDCs are oftenmisdiagnosed as solid masses by imaging techniques, and as a consequence theymay be wrongly overtreated. We report our case of a 56-year-old man with a 5 cmhypoechoic mass of the gastroesophageal junction, incidentally detected bytransabdominal ultrasonography. Neither transabdominal ultrasonography normagnetic resonance clearly outlined the features of the lesion. The patientunderwent endoscopic ultrasound (EUS), which showed a hypoechoic mass arisingfrom the fourth layer of the anterior gastric wall, just below thegastroesophageal junction. According to EUS features, a diagnosis ofgastrointestinal stromal tumor was suggested. EUS-guided fine-needle aspirationcytology revealed a diagnosis of GDC with pseudostratified columnar ciliatedepithelium. We therefore performed an endoscopically-assisted laparoscopicexcision of the cyst. In conclusion, whenever a subepithelial gastric mass is found in the upper partof the gastric wall, a duplication cyst, although rare, should be considered. Inthis case, EUS-guided fine-needle aspiration cytology could provide acytological diagnosis useful to arrange in advance the more adequate surgicaltreatment. Duplications of the alimentary tract are relatively rare congenital anomalies. Thoselocated in the stomach are very uncommon, constituting between 4 and 9% of allintestinal duplications . The structure of a gastric duplication cyst (GDC) consists of a smoothmuscle coat lined by a mucous membrane, in most cases containing a typical gastricepithelium , although a small intestinal or colonic mucosa may also be present.Generally, they are single and do not communicate with gastric lumen. Exceptionally,in GDCs a pseudostratified columnar ciliated epithelium, more commonly present inthe esophageal duplication cysts, can be found. According to Cunningham andcolleagues , GDCs lined by pseudostratified columnar ciliated epithelium could bebetter defined as foregut duplication cysts (FDCs) of the stomach. Diagnosis of a gastric duplication may be difficult even using the most advancedimaging techniques, including endoscopic ultrasound (EUS) [4–6]. Here we report a case of GDC with respiratory epithelium, misdiagnosedas a gastrointestinal stromal tumor (GIST) at EUS. The EUS-guided fine-needleaspiration subsequently performed led to a definite preoperative diagnosis, allowinga proper conservative endoscopically-assisted laparoscopic resection of thecyst. A 56-year-old man, with a history of B-related chronic hepatitis under antiretroviraltreatment, was referred to our surgical department by the Infectious Diseases Unit,where he was under follow-up. The patient did not complain of any symptom concerningthe gastrointestinal tract. During an abdominal ultrasonography, a hypoechoicround-shaped mass 4.7 cm in size, with regular margins, located between the leftlobe of the liver and the anterior surface of the pancreatic body, was found.Magnetic resonance imaging confirmed the presence of a cystic mass with complexcontent, located anteriorly to the gastroesophageal junction. The patient was then submitted to EUS, in order to better define the structure of thelesion and its relationship with the adjacent organs. 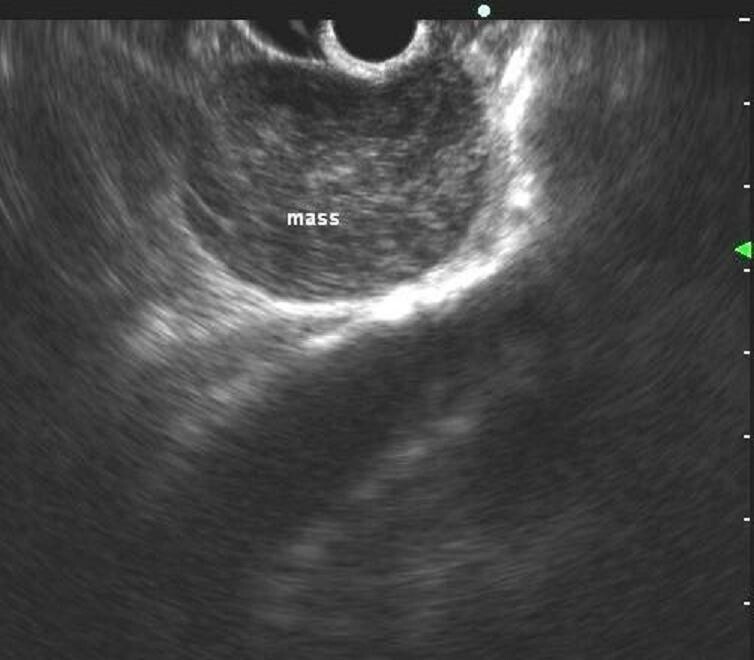 EUS showed a hypoechoic masswith slightly heterogeneous internal echoes and regular margins, located just belowthe gastroesophageal junction (Figure 1). The lesion measuredabout 4.5 cm and seemed to be contiguous to the fourth layer of the gastric wall(muscolaris propria). On the basis of the morphologic evaluation, a diagnosis ofGIST was suggested. As is usual in a case of suspected GIST involving the upper partof the gastric wall, we tried to obtain diagnostic confirmation through EUS-guidedfine-needle aspiration cytology (FNAC). The puncture was practiced using a 22 Gneedle, which, unexpectedly, penetrated very easily into the mass as it was cystic.We were able to aspirate only a few milliliters of a clear mucus-like fluid, andthen a cytological sampling was made from the cystic wall. The collected materialwas judged adequate by an onsite cytopathologist. The cytological smear showedcylindrical cells isolated or aggregated in small groups with a palisadeorganization (Figure 2). These cells showed long cilia andbrush borders similar to the ciliated cells of the respiratory tract. These basalcells had oval nuclei with finely dispersed chromatin and small nucleoli, if any.The background consisted of proteinaceous material containing debris, crystalformations and engulfed hystiocytes. On the basis of these features, a diagnosis ofduplication cyst with respiratory epithelium was made. Endoscopic ultrasound features. A hypoechoic mass with a slightheterogeneous texture developing within the gastric wall. Cytology on fine-needle aspiration sampling. Isolated and aggregatedcylindrical ciliated cells (yellow arrows) in a background containing debrisand squamous cells. Note characteristic palisade arrangement (red arrow)(Diff.Quik stain, × 270). Inset: Cylindrical cells show longcilia and brush borders similar to the ciliated cells of the respiratorytract (Diff.Quik stain, × 430). Later on, the patient underwent a surgical intervention carried out by an openlaparoscopic approach with a transhumbelical Hasson trocar (without a Verres needleto obtain the pneumoperitoneum) and four additional trocars (two of 10 mm and two of5 mm). Once the lesion was clearly identified, the overlying serosa was cut by aharmonic scalpel (Harmonic Ace; Ethicon Endo-Surgery, Cincinnati, OH, USA). Througha cautious dissection performed under endoscopic control in order to keep the cystintact, to prevent perforation of the gastric wall, the mass was totally exposed andthen completely resected using a linear endoscopic stapler (Echelon™ 60;Ethicon Endo-Surgery). The surgical procedure was completed by performing a Dorfundoplication. The patient had an uneventful postoperative recovery and wasdischarged on the seventh postoperative day. Pathologic examination of the surgical specimen revealed macroscopically a cysticlesion 5 cm × 3 cm × 3 cm in size with a mucoidcontent. Microscopically the cystic wall consisted of mucosa, subepithelialconnective tissue, a layer of smooth muscle and an outer fibrous capsule. Focallythe mucosa was lined by gastric foveolar epithelium with cardial glands but most ofthe cystic wall was lined by a pseudostratified columnar ciliated epithelium (Figure3). These features were consistent with a diagnosis offoregut duplication cyst of the stomach. Histology on surgical specimen. 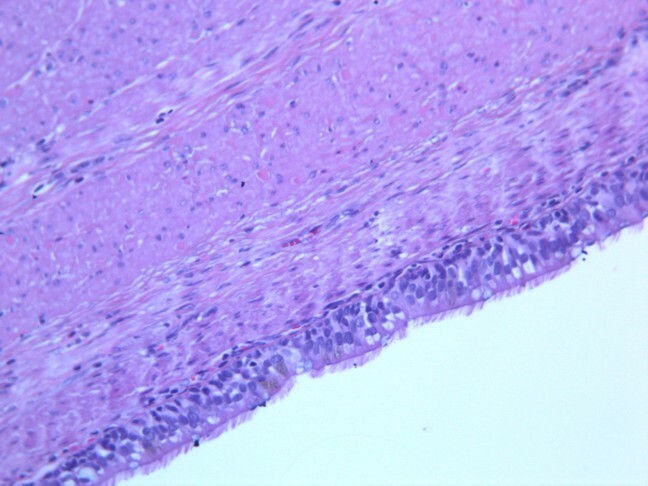 Histological sections of the cysticwall showing a cylindrical pseudostratified mucosa on a muscular wall.Epithelial cells show cilia as in the ontogenesis of primitive gut(hematoxylin and eosin, × 270). GDCs with a pseudostratified columnar ciliated epithelium (also named foregutduplication cysts of the stomach) are supposed to originate from a respiratorydiverticulum, arising from the ventral foregut . This type of gastric duplication is very rare. Including the presentreport, there have so far been only 21 reported cases. Evaluating patient data,summarized in Table 1, gastric FDCs seem to be a late-onsetdisease with no differences in relation to gender. In most cases these lesions arelocated in the upper part of the stomach: at the level of the cardia, near thegastroesophageal junction, or in the anterior or posterior wall of the fundus. Veryoften, as in our patient, they are asymptomatic and incidentally found. Symptoms,when present, are not specific, including mainly abdominal or epigastric pain.Consistency of FDCs can range from a thin free-flowing fluid to thick proteinaceousmaterial . M: male; F: female;; NGEJ: near gastroesophageal junction; LC: lessercurvature; GC: greater curvature; PW: posterior wall; AW : anteriorwall, NA : not available. Despite advances in imaging, cysts that contain solid secretions can often bemisclassified as soft tissue masses. A rate of computed tomography misdiagnosisranging from 43 to 70% of cases has been reported [9, 10]. Magnetic resonance imaging does not seem to significantly improvediagnostic accuracy . Therefore, in the majority of the reported cases, a definite diagnosiswas made only during surgical resection or by pathological examination on surgicalspecimens [11–14]. EUS is currently the best available method for the diagnosis of thesubepithelial lesions of the gastrointestinal tract. This technique has also beenproved to be superior to computed tomography scan in distinguishing cystic fromsolid masses , but the diagnostic accuracy of EUS is affected by the variation ofintracystic contents. The use of contrast-enhanced EUS may also be very useful inthe differential diagnosis of digestive diseases [15, 16]. However, we did not find in the literature any paper discussing the roleof contrast-enhanced EUS in the diagnostic evaluation of GDCs. On the basis of EUS morphologic findings alone, a GDC may be misdiagnosed as a GIST,which is the most common gastric subepithelial lesion, as in the case reported byJiang and colleagues . In the present case, EUS findings also suggested a diagnosis of GIST.Since the surgical treatment of GISTs involving the upper part of the gastric wallmay require an extended gastric resection, we performed EUS-guided FNAC in order toconfirm the diagnosis. While inserting the needle we realized that the presumed GISTwas a cystic lesion, and the cytological sampling led to a diagnosis of GDC withrespiratory epithelium. 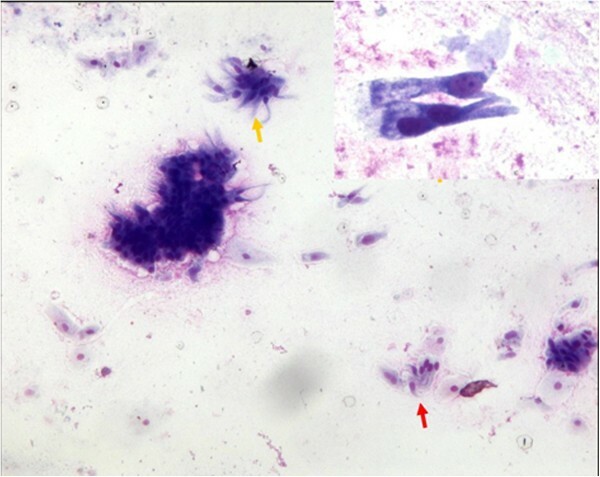 There are only few case reports concerning EUS-guided FNACof gastrointestinal duplication cysts [1, 10, 18–20], but since respiratory-type cells or detached ciliary tufts arevisualized in cytologic preparations, a definite diagnosis can be easily made . Pitfalls can occur if the cyst is lined by gastric epithelium only, asin the case described by Wang and colleagues . EUS-guided FNAC led to a cytological misdiagnosis of gastric mucinousneoplasm. Owing to the report of gastric cancer arising in gastric duplication [2, 21–23], surgery is nowadays considered the standard treatment for these lesions . The possibility of a malignant transformation is related to the presenceof a gastric-type lining epithelium. Ponder and Collins therefore suggested thatsurgery is not necessary if respiratory epithelium is recognized on EUS-guided FNAC . Nevertheless, it has been shown in the FDCs of the stomach thatpseudostratified columnar ciliated epithelium may be associated with gastricepithelium , which could be missed by cytological sampling. For this reason, it maybe that a complete surgical excision of the cyst should be recommended; also, inselected cases, some authors consider its observation as a reasonable option. Asurgical procedure that does not require a gastric resection can be easilyundertaken by a laparoscopic approach, as performed in this case. In summary, GDCs – particularly those with respiratory epithelium –represent a rare disease, often misdiagnosed as GISTs, which are more common.Nevertheless, these lesions should be considered in the differential diagnosis ofsubepithelial gastric masses, especially if located in the upper part of the gastricwall. Using this technique we will not take any chance on treating a FDC of thestomach through unnecessary extended gastric resection. Written informed consent was obtained from the patient for publication of this casereport and any accompanying images. A copy of the written consent is available forreview by the Editor-in-Chief of this journal. VN and GC contributed equally to this work. VN, AMP and GC contributed to theconception of the article. VN performed the EUS procedures. GC performed thesurgical procedure. PZ and MD’A provided cytological and pathologicalanalysis and contributed to the discussion. PS, AP, CDP and SN were responsible forthe review of the literature and drafted the article. VN and PS wrote the paper. AMPand GC revised the manuscript and approved the final version. All authors read andapproved the final manuscript.